Summer is the season of casual, the attire becomes a little more laid back and the weather warms up. Today, I'm posting more of an everyday type of look. Styling a plain tee is a casual look that I love for summer. This outfit is something for a Sunday afternoon or running errands after work. This plain black tee is my favorite, I have it in a few different colors and love to throw it on for a cute/casual outfit. A comfy pair of crop jeans and your go-to sandals and it's ready to go! 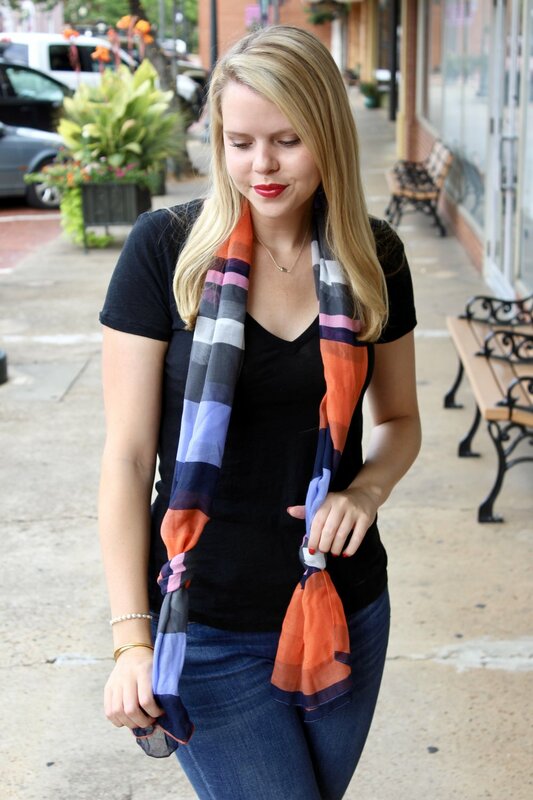 I added this colorful scarf to throw in some color but a long necklace like this one would be just as precious, too! You can find the details to this outfit at the bottom of the post! You can shop all of the details of this outfit at the bottom of the post! Happy Thursday, friends! YAY, it's almost the weekend! Which also means I will be headed to Austin in 2 days (EEP!)!! I can't wait! Today I'm sharing this pretty pastel midi dress that I looove. The colors are beautiful and feel so perfect for summer. I wore this dress to Easter church service but it would also be perfect for a summer wedding. It's not too heavy and allows a breeze for a warm day, it's also so comfy with a bit of stretch! 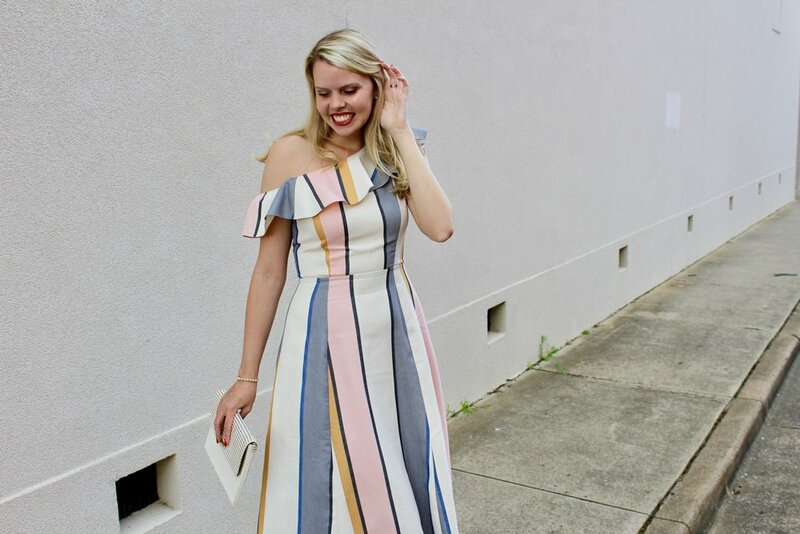 Sometimes, it's tricky finding the perfect dress for a summer wedding because of heat (especially here in Texas) but this little frock is everything you need! It has the oh SO trendy element of off-the-shoulder and I love the frilly ruffle detail. It also happens to have a great price point at under $65! You can find all of the outfit details linked at the bottom of the post! Hi friends! 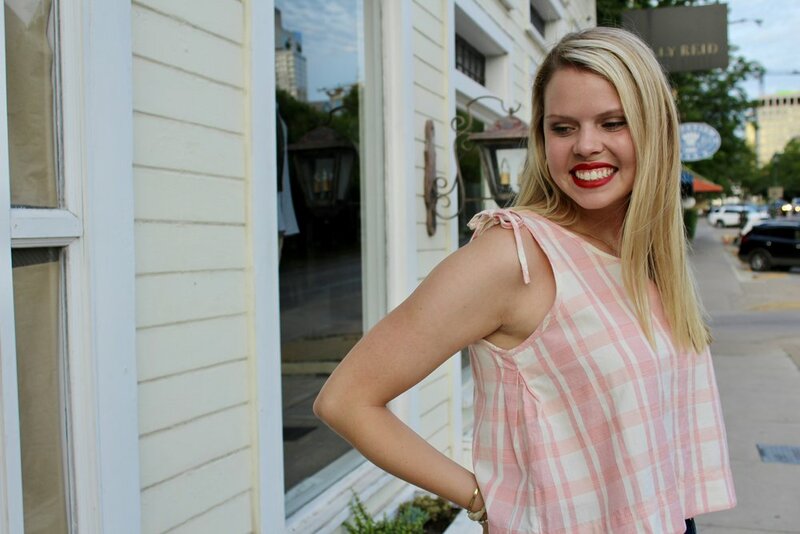 I'm so excited to share with you this precious gingham babydoll top. It feels so very retro and all-american girl. I love a classic pattern like gingham that never really goes out of style. It happens to be quite on trend this season too, so it'll be a gingham summer! This will be the perfect top for summer BBQ's and parties. *Added bonus* it has a fun little twist with an open back! It ties together with black bows down the back which is just precious! I also felt that this outfit wouldn't be complete without a classic red lip and nails (my favorite). The wedges I'm wearing are probably one of my most frequently worn pairs because they are soooo comfortable! They come in several different colors, too! I would definitely recommend them to a girl who loves a good pair of wedges. You can catch all of the outfit details at the bottom of the post!